Visit lionmusic.com for samples & press kit. 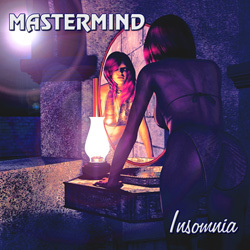 The first full length Mastermind studio album in 10 years! Originally slated to be released in 2006 um, 2007?... nope. Maybe in 2009?! No!! When then was the question?! What was starting to seem like the prog-rock version of GNR's Chinese Democracy, this mysterious album will finally see release in 2010 on the Lion Music label of Finland. The long awaited, often rumored, never before heard in its entirety, 7th full length studio album from the one and only original MASTERMIND is finally here! Introducing vocalist Tracy McShane and again featuring the keyboard wizardy of Jens Johnasson as the band moves into the 21st Century. Listen to album samples here || Read the reviews. "We had plenty of offers" remarks guitarist and Mastermind producer Bill Berends... "but nothing I thought would really be to our benefit until we connected with Lion Music. We're very pleased to finally see this album get released properly." Web release one sheet and press downloads. BUY IT HERE includes iTunes and CDBaby links.